A mass air flow sensor or mass air flow meter is an important part of your engine. Image from Flickr. 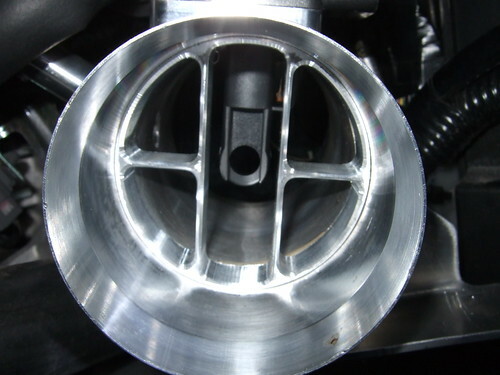 In most computer-controlled vehicle engines, a mass air flow sensor is a small-yet-important part of the engine. The mass air flow sensor is one of the most common causes for a check engine light. Cleaning or replacing a mass air flow sensor on your own is easier than changing your own oil – and can save you hundreds of dollars. A mass air flow sensor, otherwise known as a mass air flow meter, measures the volume of air entering an engine. A fuel-injected engine sprays a measured amount of fuel into the combustion chamber. The mass air flow sensor tells the computer that runs the engine how much fuel should be mixed with the incoming air for the best combustion. When the mass air flow sensor gets dirty or breaks, the fuel mixture gets either too rich or too thin. This means the engine does not run nearly as well, and gas mileage goes down significantly. Where is the mass air flow sensor? The mass air flow sensor, in most vehicles, is relatively easy to find. It is usually near the air filter. Most often, the mass air flow sensor is a small box between the air filter and engine, inside the air intake duct. There is also an electrical connection that transfers information from the mass air flow sensor to the engine controller. When the mass air flow sensor gets dirty or degraded, the check engine light will usually come on. While replacing the mass air flow sensor may be required, cleaning it will usually extend the sensor’s life by eight to 12 months. To clean the mass air flow sensor, remove it, spray it with cleaner and let it air-dry. Use a collaborator cleaner or mass air flow sensor product. Above all, it must be air dried. If you try to hand-dry it, you could break the delicate parts of the air flow sensor.